I praise God for healing me, for preserving me and for protecting my life. The counsel of the ungodly shall not stand. the country by the government and security agencies? interest in protecting the Nigerian people from the Fulani herdsmen. grazing routes. Do you agree? What do you think about his comments? from clashes as the Inspector General of Police, Ibrahim Idris, once said? problem of attacks by suspected Fulani herdsmen or not? terrorists, the herdsmen and those behind them far more needs to be done. organization and its leaders ought to be arrested and charged for murder. the states that are opposed to it have good reasons to do so? more to it than meets the eye. colonies but Fulani colonies all over the south and the Middle Belt. cattle colonies will wish they had never done so. between the indigenous Berom people and the Fulani settlers. They will not just come with their cows but also with all their people. outnumber you but they will also claim the land as theirs. if you attempt to resist them they will threaten you and kill you. slaughtering his own people in Benue state. rubbish idea, from a rubbish Minister, who serves a rubbish Government. the Fulani were destined to lead? bitter that truth may be. condemned by all men of goodwill. titled ‘Mein Kampf’ (meaning ‘My Struggle’). were ordained by God to live, serve and die for them. civilised society. It is wrong, it is false, and it is ungodly. Dangerous Delusions Of Umar Muhammed Labdo”. that his view is a minority view. is the bitter truth and we must accept it. of our children and generations unborn. before God and I believe that anything outside of that is evil. qualified for it than anyone else. 500 years ago before any other nationality in Nigeria could read or write. What do you think about these assertions? take the lead than they were or are. be told education came to them very late. That is why they said 1953 was too early for our nation to have independence. and far better educated south. Fodio was still learning to ride a horse and planning his jihad. Leonne which was part of Durham University in the late 1800’s? 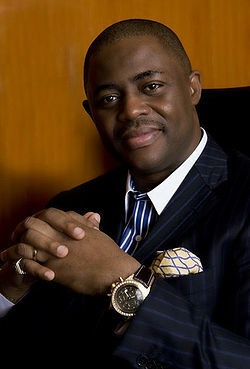 Adetokunbo Fani-Kayode was many years later? what was the nature of that education? great Kings College when it was really Kings College in 1901? Yoruba lawyer, Sapara Williams, was called to the bar. Kanuri and much of the north were far ahead of them. well behind the Attas and the Abdul Rasaq’s. and they came with the sword. qualification or education that they never had. knowledge and education as Labdo would have us believe. say “oh we are talking about Islamic education and not western education”. his delusion and his arrogance of power. Fulani were reading transcripts 500 years before. painful as it may be this is the bitter truth.